Weird coincidence: If you’re in Falmouth Harbour, Antigua, and want a great roti, ask for Grace. If you’re in Codrington, Barbuda, and want a great roti, ask for Grace. 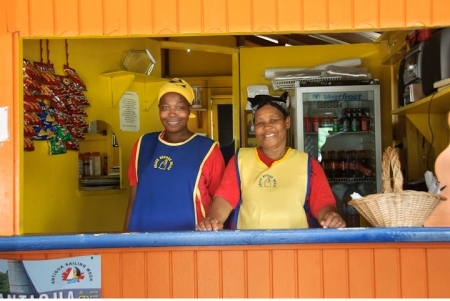 If you’re in Chaguaramas, Trinidad and want a great roti, ask – you guessed it – for Grace. Three different islands, three different Graces, three different styles of roti, and each one a winner. Let’s start with Grace Piper in Falmouth, Antigua. 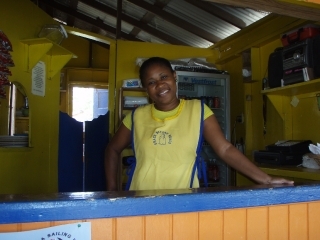 Originally from Grenada, she’s been keeping locals and visitors happily fed for 21 years at Grace Before Meals, her small, cheerily painted place on the road between Falmouth Harbour and English Harbour. prepared by Grace Piper (right). Although she serves full meals – the likes of curried conch, baked chicken, and baked pork, with macaroni pie, provision, rice, and salad on the side – I’ve never strayed from her roti. More specifically, I’ve almost never strayed from her conch roti. By her own admission, Grace is fussy. (“She’s a tough nut to crack,” says Tassai Shaw George, who works with her.) She won’t use just any conch: Hers come from a special guy in St. John’s, who takes them out of the shell for her, but does nothing more. Grace cleans, pounds, and cuts them into pieces herself, to her standards. The result is that her rotis are stuffed with big, tender, meaty, satisfying chunks of conch. (No skin, no unidentifiable rubbery bits.) There’s potato in there, too, but conch is unquestionably the main event. Grace makes her roti skins with whole-wheat flour – a nice change from the usual white-flour ones – and serves them with her homemade mango chutney spread on top. No surprise, she makes her own pepper sauce and fruit juices, too. The first puts me in need of the second; I’m particularly fond of her tart-sweet fire-quenching tamarind juice. The drink of choice to accompany a roti made by Grace in Codrington, Barbuda, on the other hand, is a cold, Antigua-brewed Wadadli beer. Though Codrington, Barbuda’s only town, is quite small, you’ll definitely have to ask directions to find your way to the Grace who makes roti here. 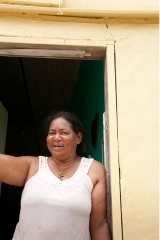 She works out of her house, and there’s nothing as obvious as a sign to tip you off; you need local knowledge, or the ability to divine that the other people liming with cold Wadadlis in her front yard are actually customers waiting for their roti . This Grace is from Guyana, and what makes one of her rotis so tasty is its Guyanese-style wrapper. After cooking the roti skin on her tawa – a round griddle that she greases with ghee – she “claps” it between her palms, which makes it light and flaky, almost fluffy. This “clapping” is the Guyanese equivalent of the Trini technique of beating the roti skin with two paddles while it’s on the tawa, breaking it into flaky, melt-in-your-mouth strips for “buss-up-shut.” (Buss-up-shut is essentially a deconstructed roti, with the filling served alongside the busted-up wrapper; the name is derived from “burst-up-shirt,” since the torn bits of roti resemble ragged strips of cloth). The chicken-and-potato filling at Grace’s in Codrington is good, but not extraordinary. It’s definitely the wrapper that makes this Grace’s roti special. You’ll find the third Grace at The Roti Hut in the Power Boats boatyard in Chaguaramas, Trinidad. The line-up for Grace Williams’s roti and buss-up starts each workday at 11:30; arrive at 1:00 (or maybe even 12:30) and you may find yourself sorely disappointed, your favourite – or everything – sold out. Trini-style rotis are my absolute favourite, and Grace’s are among the top three Trini rotis I’ve tasted. (See my “Off the Eaten Path” Travel Tips for one of the others.) What distinguishes a Trini roti from those on other Caribbean islands is that it doesn’t just contain the filling you order. Say you order Grace’s curried duck, lamb, or goat roti; it’s also going to contain “sides” like stewed bodi beans, pumpkin, or channa (chickpeas) and potatoes, as well as mangoes or pomme cytheres (golden apples) cooked in amchar massala. And, of course, homemade pepper sauce, if you wish. Grace confesses that her husband, Gary, is actually the one who makes the curries, while she’s responsible for turning out the roti skins and buss-up. They season the meats with a green seasoning they make themselves. Everything, in fact, is prepared from scratch each day, which is why it all tastes so good, and why there is always a line-up well before they start serving.